A Medicare Advantage Plan, also known as “Part C” is a health plan offered by private insurance companies. The private insurance carrier will become your primary however you will need to remain enrolled into Medicare Parts A and B. Medicare will pay these insurance companies to cover your Medicare benefits. If you join a Medicare Advantage Plan, the plan will cover all of your Medicare Part A (hospital insurance) and your Medicare Part B (medical insurance) coverage. Some of these Medicare Advantage Plans will cover your Part D (prescription coverage) as well. 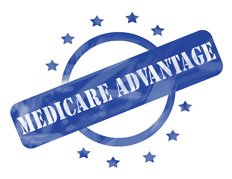 Most Medicare Advantage Plans are either an HMO or PPO so you will have a specific network of doctors. Each plan has its own set co-pays and costs, formulary of prescriptions and sometimes additional added benefits above what original Medicare covers. For example, one plan might charge a hospital co-pay while another plan may not. You will want to be sure to review the plans costs, formulary and physician network (especially if you are wanting to keep your current doctors). Medicare Advantage Plans may change annually (January 1st) so you will want to review the plans benefits when they are mailed out in September. Medicare itself states: Limitations, copayments and restrictions may apply, and each plan’s benefits, formulary, pharmacy network provider network, premium and copayments may change on January 1 of each year. Members need to be diligent about reviewing the plan materials sent to them each year to see what changes might be taking place. Choosing the right Medicare Advantage Plan may sometimes be difficult to do. Please contact us directly to help navigate you through the different programs that are available in your area!